Splash pages, you gotta love 'em. A blank canvas where the artist can hit you with a large dose of illustrated 'wow'. This week, a flashback to the pre-dark, pre-Wolverine days of X-Force! 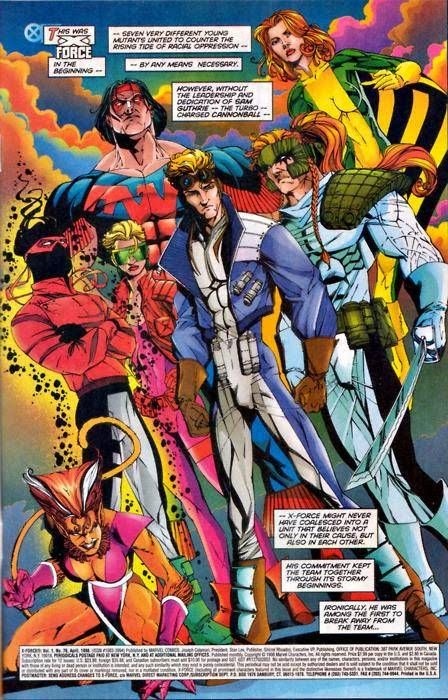 While any X-Force line-up isn't fully loaded without Cable and Domino, just seeing Warpath, Cannonball, Sunspot and Shatterstar here, with all their bright colours and bravado makes me wish I'd taken more time to enjoy 90's comics when they were around. I tell ya', the older you get, the more you love them back issue bins. What do you think? For more great splash pages,click here. Pretty good eye you have their mr Dale! Ha ha. He just has a distinctive style for me, even if he's a lesser-known artist.